When I discovered D&D as a freshman in high school back in 1978, I immediately wanted to Gamemaster my own World. That was my instant reaction. I was duly informed that our town’s Society of Gamemasters was strictly Anti-Gygaxian (for a variety of reasons, not including that we didn't like OD&D, though we all admitted it had its flaws) and while you could use the three original rules books to do so, it was required that every GM create their own rules system. And so, Elthos was born in 1978. Naturally, like all good parents, I love my baby. What Elthos had going for it in 1978 are still features that I like today. Elthos' foundations are loosely (very) based on the original three RPG booklets, and so it has the classic RPG tropes of Classes, Races, Hit Points, and so forth. Nothing unusual there. However, under the hood it’s a lot cleaner and more modularized than OD&D. What I wanted from my RPG was a system that could expand indefinitely without my having to add a new chart every time I wanted to add a new skill or weapon, or power to the thing. It uses a tidy little General Resolution Matrix as the core mechanic for what we moderns call "Conflict Resolution", the same one that I created in 1978. The idea is that every action has an associated Skill and conditions which create a Level of Difficulty. So the odds of success for all actions can be summed up as a ratio of the Skill Level vs. the Difficulty Level. It’s simple, flexible, and I'm pretty happy with it. Because, of course, it’s mine. Or maybe because it's a good system. Who knows? Like most parents I dote over Elthos quite a bit, and have tried my best over the years to see that she develops into not only a wonderful rules system, but also a wonderful World. I am probably overly proud of her to some degree. The fact is, I have been Gamesmastering Elthos for a little over 30 years now, and I’m still having an absolute blast with it. RPGing is one of the best hobbies ever created. I honestly think so. After a long stint real world adventures wherein I hitchhiked around America for about 10 years, and did some very fabulous world travel after that, I met a Japanese-German aristocrat-wizard going by the name of Count Lowengrin VIII, who gave me my first medieval classic as a gift; Tristan & Isolde by Strassboug. He suggested that if I liked it (which I very much did) that I should continue in that vein by following the trail of books listed in the bibliography. That led me on to other medieval classics such as Parzival by Von Eschenbach, The Quest for the Holy Grail, Sir Gwaine and the Green Knight, Piers the Plowsman, The Death of King Arthur, The Ladder of Perfection, and many, many others. After I devoured every medieval classic I could get my hands on in second hand book shops, I went in for Greek, Roman, Biblical and Sumerian Literature, finally circling back around to give Medieval another grand pass after about 10 years of prodding bookshelves across the country. So, another thing that I love about Elthos is that she has encouraged me to become something of a scholar on the topic of Classical Literature. Naturally, this all has helped me considerably with the story aspects of my game and it’s been quite illuminating in a number of ways I won’t go into here. After my stint on the road I decided to go back to college and get a Bachelor’s Degree in History. I graduated with Highest Distinction and was accepted into the Fraternal Society of Historians, Phi Alpha Theta. This too was motivated by my love of Elthos as I wanted to be able to Gamesmaster Campaigns that had not only a literary flair, but were also, to whatever degree practical for gaming purposes, historically grounded, at least in so far as I understood things such as medieval engineering, how kings and queens operated amongst the nobility, what peasant life was like, and that sort of thing. I was interested in the grand sweep and panorama of the historical process, and how civilizations are born, thrive, get old and eventually die. The highlight of my college experience was my ‘Student Year Abroad’ wherein I found myself studying Ecclesiastical History, Latin and Medieval Studies at Edinburgh University in Scotland. That was utterly grand. I took the opportunity to travel all over Britain, Holland, France, Austria, Germany and Greece looking at ancient castles, ruins, cathedrals and cities. All to the good of my Gamesmastering Elthos. In addition to my study of history, I also became an avid fan and student of Political Theory and studied Thucydides, Socrates, Plato and Aristotle, among quite a few others. I was so enamored by Political Theory, in fact, I was offered a chance to skip taking a Master’s Degree and got accepted directly into the Ph.D. program for Political Theory at Boston College. I declined the offer, but Political Theory gained a strong undercurrent in Elthos. It’s a fascinating subject, that had it not been for Elthos I probably would never have encountered. The Elthos World evolved over time, beginning with The Iron Legions of Telgar Campaign in 1978, and progressing to The City of Stone Campaign by 1986, and then evolving into the Korack Campaign by 1994, and finally the Hamfest and Hobbington Campaigns of the 2000’s. 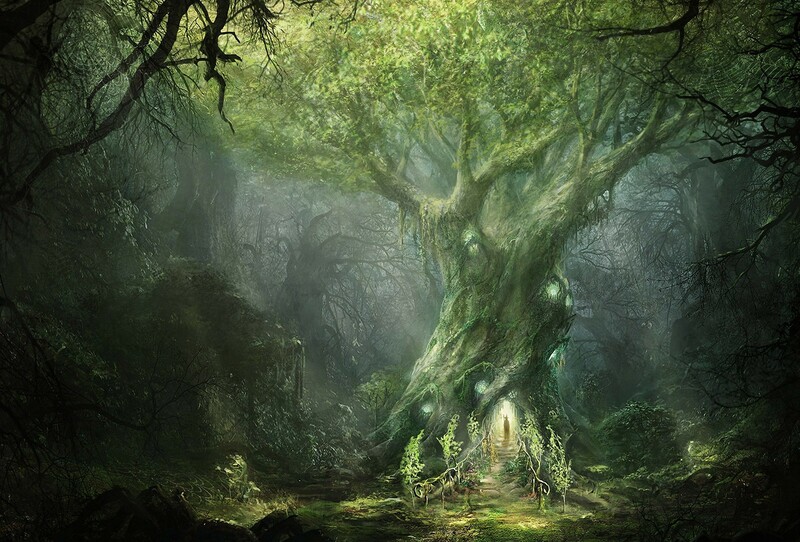 The style of the World is a fusion of medieval and celtic fantasy, Arthurian Romance, fairyland, and science fiction. It’s formed one continuous three decade story, some of which I took the opportunity to record and transcribe into several novel sized books (263,000 words comprise the written version of the 2011-2013 Hobbington Campaign). These books are enormously fun for me to read, and they may actually even be enjoyable in their own right. I’m not sure. But at any rate, I really enjoyed writing them and posting the chapters to my blog. So in this sense, I love Elthos because it’s creative inspirations take on myriad of forms, inspiring me to become a writer, artist, musician, cartographer, improvisational actor and a poet, all of which I’ve used in my games. Naturally once I graduated from College I had to find gainful employment of some sort. History was not going to do, nor was Political Theory. These are wonderful studies, but in 1994 it seems increasingly clear that there was not going to be any money in either, and the best one could hope for would be a marginal chance of making a long term career as a tenured professor. That might have been an idyllic life for me, in theory, but other concerns turned me aside, not the least of which being that I had already spent 10 years on the road and so was about a decade behind in career building. So after graduation I was casting about for what to do. I hadn’t much of a clue, frankly. But once again Elthos gave me an interesting idea. In 1994 I began working slowly but steadily on developing Gamemaster Software. My desire to create Gamesmastering software for Elthos impelled me into my next career – Software Engineer. I mean how much can you ask from an RPG, really? I think I’ve gotten my money’s worth! But still, the story goes on. In 1994, after a two month stint with my friend David Kahn learning the basics of DOS in Minneapolis, I began to self-study QBasic at my kitchen table after work, and created my first set of Gamemaster programs; a random monster generator, and my first on-screen hex grid with moveable “pieces”. At that point I had begun the (unexpectedly long term) task of programming the Elthos Rules into a Gamemaster utility I called The Gamesmaster’s Toolbox, in Visual Basic. Those of you who know my nom-de-plume may guess what my opinion of VB turned out to be ere the end of that process. Thus my work on Elthos translated into a 20 year stint as a professional Programmer/Analyst at a mid-sized Corporation in Connecticut. All the while I tinkered away at the Elthos Program during my off hours. First I created a full blown and incredibly comprehensive Gamesmaster’s Toolbox in Visual Basic, which took me from 1994 until 2000 to complete. Although I thoroughly enjoyed the challenge of programming the GM Toolbox, and used that as impetus to teach myself database design, SQL, and ASP, all of which rocketed my career forward, and I think the project has some interesting features that I still haven’t seen anyone else tackle, Visual Basic, if you don’t know, is kind of a broken and peculiar language that people love to hate for good reason. And so, despite the Gamemaster’s Toolbox’s wondrous charms, in the end I couldn’t see sending it out into the wild, despite six years of work on it. It was simply too buggy and I figured I’d get buried under an avalanche of tech support calls. Oh well. Shrug it off and move on. Instead of putting it into the public domain, I simply chiseled away at it, simplifying the back end code, rationalizing the database structure, and adding what I felt were cool and interesting features for another six years. Yay for me. I’m pretty sure at this point history will conclude that I probably didn’t handle this in the best possible way so far as getting Elthos published is concerned. Ok, don’t rush me. I’m a slow-poke, I know. All that said, I did do at least one very interesting thing with the Gamemaster’s Toolbox. I ran an RPG Game Club for kids through our local Community Center, and another one through private contacts, and in total made about $2500 Gamemastering overall. I wanted to prove that it is possible to make money at Gamemastering. The reason is because I’m convinced that in the future it will form the foundations of a new entertainment industry of live Gamemastering in conjunction with the advanced technology of the computer age. It’s a hunch, and I feel that with Elthos I was able to take the first step in that direction. So I can add this to the list of amazing things that Elthos helped inspire me to do. Another thing that I should probably mention about Elthos that I really like is the Alignment System that I worked out for it. I was rather put off by the original Alignment System stuff from early editions of D&D because they seemed to be too static, and too restrictive on the Players. But I did like the concept of Alignment, I just wanted it to work differently. What I did was worked out a mathematical way of tracking Alignment, and using the idea the two axises to formulate a metaphysics that could form the basis of that system. So when Players do things with their Characters that have moral (good vs evil) or metaphysical (law vs chaos) implications I find out from them what the motive of the character was (can be things like 'friendship', 'altruism', 'revenge', 'adventurousness', etc) which have a Morality Rating, and that sets the Good / Evil value, and I assign the Metaphysical according to the the nature of the event. So for example, if Robin Hood steals from the rich to give to the poor, it is stealing which is Chaotic (-3 LawChaos), but the motive is Charity which is Good (+2 GoodEvil). That makes Robin Hood's action Chaotic Good, and his Alignment changes by that amount. So if he started the game at LC 4, GE 3, he would be at LC 1, and GE 5 when he does his thing. So instead of telling players "No, you said you're Lawful Good so your Character can't do that", I simply ask, "What was the motive?" and then chart it out. If the Player really wants a Lawful Good Character they can certainly have one - so long as their Character behaves accordingly. Naturally, when the numbers get to certain levels then the Deities may notice and begin to interact with the Character based on their Alignment. I should note that after 30 years or so of playing Alignment this way, I've found that despite what many Players say they want, most turn out to hover around neutral for most of their careers. Interesting. Also, in relation to this, I wanted to have my Alignment System tie into my Metaphysical system for my World as well. 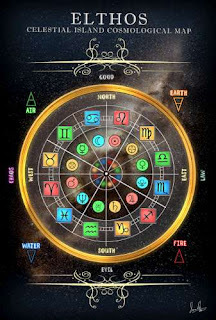 To this end I spent a number of years researching the Tarot and Astrology, numerology and Kabalah to try to put together a system of symbols and correspondences that would serve a useful purpose for me as Gamemaster. A problem that I had GMing for the first decade or so was that I wanted to have some sort of underlying symbolism in my World that made some sort of sense. So when the Priest stood up on the dais and pronounced that the Eagle Flying from the West means that some great event was going to happen, that it would actually be symbolically significant, and if you as the Player understood the symbolism you could correctly interpret the events. Kind of esoteric, but I thought it would be a grand thing to have. So after a number of years of tinkering around with it I finally managed to work out which alignments fit with which astrological signs, and from that which tarot cards go with which signs and planets, and so on. The final result is the Elthos Tarot Deck. The artwork was done by Jason Moser, and he did an amazing job, and I think the Deck looks great. You can see the back facing card showing the Cosmological Map at the top of my post. It ties together my metaphysics and my Alignment System and gives me a symbolic framework which underlies the spiritual aspects of my World. Kinda fun. I've used it to good effect on numerous occasions and it's another thing I love about Elthos. In 2006 I founded the Literary Role Playing Game Society in Westchester, NY, with the objective to tackle the question “How can we make our Worlds higher quality, and obtain more literary aspects with our Gamemastering?” So this was another offshoot of my work on Elthos, and through it I made a host of new friends with whom I held a long string of really fabulous meetings at our local pub talking Gamesmastering. Lots of great ideas came out of those discussions. In the process, I realized it would be quite cool to have a mini-version of Elthos to try things out with in the pub, unobtrusively… my new goal was to make an RPG Mini-System. So I started work on a complete distillation of my original Elthos Rules, and came up with The Elthos “One Die System” that uses one six-sided die to run the entire game. It took me about three months to figure out how to do so with the required amount of elegance. Every aspect of the original rules was either shaved off, or shrunk down to tiny size. Attack Levels go from one to six. Armor Classes go from one to six. Weapons do 1d6 plus or minus 1, depending on size. The idea was to create a rules system that uses small numbers and as few charts as possible to run a full blooded RPG World. I wanted it to be genre-neutral as well so I could use it to run any kind of Campaign I may come up with in the future. Wild West with Magic? No problem. Sci-Fi with Space Giants? Yup, can do. And so on. And by using what I call tiny-numbers math it would also make it possible to Gamemaster the Elthos ODS in my head without too much strain. I wanted to get past the days of heavy number crunching and brain fatigue by the end of a gaming session. Those were the design goals for the Elthos ODS. As the original Elthos was designed to be modular to begin with, it wasn’t all that difficult a task, comparatively speaking. The funny thing is, we never actually used it at the Literary RPG Society meetings, but once it was in rough shape and seemed to work pretty nicely, it gave me another idea. What if I programed the One Die System into a Web Application using ASP.Net and SQL Server? The new Elthos ODS would be far easier to program than the original system, and it could form a code base that would have the virtues of compactness and simplicity. By making it a Web Application I could host it online on one server, and any updates would automatically propagate to everyone who might be using the system. It would give Gamemasters a way to be able to build their Worlds online from anywhere, and also provide a way to allow Gamemasters to share their creations with each other. Bingo. That really sounded like a great idea. Thanks Elthos! The programming and design work went quite well between 2007 through 2013. Once the basic concept was fleshed out in 2008, I began Play Testing it with some friends. That went on for quite some time, and between 2008 and 2015 I have played somewhere around 300 games with it. During this period we ironed out various kinks and whatnot, and at this point, to be honest, I like the ODS better than the original system. It does everything that the original system did, only much more simply. It works very nicely for me and I’m pretty happy with it. The Mythos Machine has almost all of the features that the original Gamemaster’s Toolbox has, except for the Virtual Table Top mapping utility that lets you paint maps with different terrains that keeps track of movement, and the part of the original application that ran and tracked combat. I decided that I should focus the Mythos Machine on being a Gamemaster Prep Tool, rather than bring in the Virtual Tabletop aspect of the original Gamemaster’s Toolbox. Good choice? Bad choice? Who knows? But the truth is, I still have the original Gamesmaster's Toolbox code and it's really not all that difficult these days to convert over to the web. So I'll probably get around to it, if I get far enough. Of course since I function at museum speed it might be quite some time before I get around to that. We'll see. In 2014 all the features for a Phase I deployment were complete and I named it The Mythos Machine. I then upgraded the Mythos Machine in order to augment it with additional dice options which I named the Opti-Die System (still ODS), and added a number of other enhancements and features that were not part of the original Gamemaster’s Toolbox. Finally, I decided to go whole hog and share it with others on the Internet, and so it will go into a Rolling Open Beta in a few days. I’m pretty excited about it. For those who may be interested in what the Mythos Machine feature set includes, you can take a gander at this Diagram which outlines its primary features. So, what do I love about Elthos RPG? Not only is she a great RPG system, and a wonderful World, but she’s the also been the foundation of my studies, my career, my writing, artwork and poetry, and as far as I’m concerned, in her totality she represents a solid step forward as a representation of the RPG as a new art form for the 21st Century. My hope is that she will continue to prosper and add many joys for myself and others in the years to come. I'd like to talk about my Beta Test, as the process has been a great learning experience for me. I'm working on getting the Elthos RPG and The Mythos Machine (my web application that supports the rules) out to the public soon, and have been running a small Beta Test, called Beta 24. I wanted only 24 Beta Testers so that I could manage the incoming feedback and not be swamped, and use the experience to find the most efficient ways of storing and managing the incoming information. This way I can learn how to efficiently categorize and prioritize the feedback and make the process as useful as possible. 5. Direct Email to me. I got 24 people to sign up. In the first week 18 of 24 people filled out the survey and then I created a login for the web application and forum for them and sent it by email (this method was recommended by my marketing guru). I created SurveyMonkey surveys of 10 questions or less, one for each week's goals asking basic questions and for any recommendations based on the goals for that week. Week 1 - Download the Rules PDF, reading it, and taking the survey. I also let on that I would be providing Rewards for feedback - either in the form of thank you artwork, or through the accumulation of Awesome Points which would be redeemable in free service at a rate of 1 month per Awesome Point, though this idea is more intimated than clearly defined as I'm still working out the best way to do that. Note: I kind of rushed into the Beta to try to beat the Con Season... not necessarily the best idea, but I also feel I need to push forward and this is an effort do "get going" even if it isn't perfect. So not all the details have been worked out - but I consider this Beta as a Beta of my Beta Testing process, so to say. As I have very few Beta Testers I am hoping that the "working this out" part wouldn't be too disruptive... though in retrospect, I think this is possibly another contributing factor to the lack of responsiveness. The more organized and professional a process is, the more likely it is to succeed. But we all have to start somewhere, of course, and this is my first crack at anything like this. The Beta 24 has a Start Date and an End Date 12 weeks later. It's a structured approach with Weekly Goals that also serve as a Tutorial process through the Rules System as well as the Mythos Machine. The survey responses, when they came, were actually quite useful and interesting. To date, no one has responded on the Forum, nor even logged in to look at it. The Google+ Community has gotten a tiny smattering of input from the Beta Testers, and that has been mostly comments like "I'm not sure how to find your site... I can't find the original email". That point is interesting as it illustrates a core problem - when I sent out my communications, regardless of the medium (email, forum, or via Google+ Community) if they didn't respond right away, then the communication vanished into the miasma and is not longer findable. Naturally, with emails, people simply delete them. With the Forum, no one logs in (I suspect that is because logging in to something represents a hurdle, and no one wants to bother with a hurdle). The Community has the problem that Google designed it to be Stream-Of-Consciousness... and so stuff gets lost in the miasma by design. It's a poor medium by which to try to store organized information. At the end of Week 3 I postponed the announcement for Week 4, because by Week 2 it seemed I only had a trickle of responses (5 out of 24), and Week 3 resulted in 0 responses. To the left are the results thus far. Two of the responders, by the way, are insider friends of the project. I also know that the Beta Testers downloaded the rules book, and when I posted that I had upgraded the rules, pretty much everyone downloaded the upgrades. So they are listening... but not commenting or providing feedback, which I find very interesting and is actually a significant piece of feedback in itself, not about Elthos RPG, but about the Beta Test. Please note - this is an observation, not complaint. I hold myself responsible for the outcome of the Beta process. From a responses perspective this has been somewhat disappointing, if not completely unexpected. I found from my queries to the community that generally speaking, Beta Tests often have these kinds of results. That said, the positive news is that I've learned a lot from my experience with Beta 24. I can see there are a number of hurdles that I need to overcome to get a good solid beta going. This is what I'm concluding. 1) All messaging needs to be short, relevant and to the point. 2) Having too much structure hampers the process. The time frame and weekly goals creates too much overhead, and an impression of too much work. 3) Google Communities is fine for informal chatting. 4) The Forum is not that useful. 5) Surveys have worked pretty well. 6) Any reward system needs to be clear and simple. So as far as learning important lessons from Beta 24 goes, it's been a big success. I'm gong to work on all of that, and I think I will soon transform the Beta 24 into a Rolling Open Beta which will resolve these issues. The Rolling Open Beta idea is to allow people to come in as Beta Testers any time by creating a Beta Test Account, with "Beta_" in the name. So "Beta_JohnDoe" would work. With this they will be directed to the Instructions for the Rolling Beta, which is the Weekly Goal framework, with video tutorials on the Mythos Machine goals. The entire system would work as a tutorial for the Mythos Machine, while soliciting feedback in exchange for Awesome Points. The Weekly Goals would be renamed "Part 1", "Part 2", etc, so that there is no time pressure. People can go through the Beta-Tutorial program as quickly or slowly as they wish, and use it either as a Tutorial system, and / or Beta Test where they can gain Free Service (or other possible goodies, tbd) in the form of Awesome Points. The question that I have about this model is ... what is the difference between coming in as a Beta Tester, and just being an ordinary user? I mean if I'm assigning Awesome Points for feedback, why not allow ordinary users to also get Awesome Points for feedback? Well, the reason why is because everyone would then simply write in any feedback and get Free Service... so that wouldn't work. A Beta Tester has a Beta Account... and that's specific to the Beta Test... hmmm... well, as you can see - I'm still in the process of brainstorming on this idea. The details need to be worked out. The more I think about it the more it seems that the problem at its root is that people do not want to deal with anything complicated, and they want to get things for free. This of course runs against the need of the game designer to get relevant feedback. Ultimately, the simplest form of feedback is whether or not people use your product. If they use it, that's positive feedback. Most people will not say one way or another if they like or don't like a product. They have no obligation to do so, and most people resent being asked to do so without some sort of reward. They will, however, be likely to complain if something is broken. Given this - I'm almost persuading myself that the effort going into trying to set up and conduct Beta Tests is actually something of a waste of time and effort, and has a tendency to be disappointing (as I've heard from other designers who I have queried about this). How much of the information we get back is actually all that useful? Maybe not much. Perhaps the better way to go is simply put the product out there and offer a feedback mechanism that lets people, should they wish to do so, offer feedback. The true feedback in fact is the simple binary... are people using the product? And for those who use it, if they like it they probably won't comment. If they don't like something, or want to see an enhancement, or found a bug, they may well comment. The reason why... because if they are using the thing, it's because they find it compelling enough to use, and if they find a flaw they probably would like it even better if it's fixed. Hence they are fairly likely to provide feedback at that point. I'm not sure if that all makes sense or not. The question is the Effort / Benefit ratio. There is obviously benefit to getting feedback. But how that feedback comes in, and whether or not I attempt to provide an orgainzed process for collecting feedback, or let feedback simply come in as it may ... That is the question. It seems to me that most GameMasters that have a story in their minds, a vision of a World, also have something that they'd like to say. Or perhaps a better word would be 'teach'. They want to bring their Players into a World in which certain points can be made and illustrated through the course of play. Some GameMasters may not quite realize that this is somewhere near the heart of their endeavors. But it very likely is there. An example of this might be the GM who believes that the Universe is really just a gigantic eating machine, as my late friend David Kahn used to say. And in his own way he demonstrated this through his World of Telthanar. When we encountered beings of tremendous power and mind boggling motivations, it became quickly apparent that these beings were just as likely to stick a fork in us and shove us in their mouths as they were to engage in some kind of dialog. And those dialogs were just as likely to bring about the dining pleasure of our ill-met conversationalists as anything else. It was not that everything in Telthanar tried to actually eat us... but the overall impression was that sooner or later we would get "et", as David used to say with a dry eye and wry grin. It seemed to me that he took great pleasure in our astonishment at the underlying voracious attitude of the creatures and beings that we encountered in Telthanar, and it was those Players who most quickly adapted to this reality and achieved a composure as ruthless as those we encountered that fared best, and climbed highest. Telthanar was as amazing as it was astonishing, and those of us who had the pleasure to adventure there are unlikely to ever forget it. And as David most likely wished, we all learned a few valuable life lessons there as well. Sometimes things do want to eat you, you know. Other GameMasters have other points to make about what they see as "the true nature of things", either metaphysically or politically, or socially. Many, though, do not see their Worlds as a platform for illuminating these ideas. Some may not even know that any such ideas permeate their Worlds at all. I would argue, though, that whether they know it consciously or or not, every World is an expression of the innermost convictions of it's GameMaster. Those GameMasters, however, that consciously know that they want to express their philosophies through their World are numerous, though even among these they may not wish to expressly declare as much to their Players. Partially because it might ruin the surprise, or disrupt the lesson, in a similar way as telling someone "The butler did it" as they pick up a mystery novel. Still, though, the intention to teach lessons is quite likely there, at some level, and to some degree. Some GameMasters wish to express the idea that Truth and Nobility are the most important virtues in life. Some wish their Players to understand that in the world of Politics no one can be trusted. Some wish simply to impress upon us that careful planning and diligent attention to detail is our best route to achieving our goals. Most GameMasters have a whole pocket full of ideas and lessons they'd like to impart, and often use their Worlds as a stomping ground for their most far flung and outlandish musings. Their Players are quite likely to be subject at times to the underlying philosophic conundrums of their GMs most convoluted and perplexing ideas. Many GameMasters in fact offer us a plethora of potentially valuable life lessons... all to be learned through the auspices of the wondrous invention of RPGs. This is, in fact, one of the most profoundly fascinating aspects of RPGs. And the fact that many GameMasters keep the subject and intentions of their lessons a closely guarded secret during the course of play is a necessary and equally fascinating aspect of the nature of the game. No one wants to simply spill the beans and blurt out what hidden treasures are in store. Every GameMaster worth his salt wishes for the Players to stumble upon such things themselves, and have that quintessential moment of realization for themselves. Getting the Players to the point of "Aha!" is one of the great pleasures of GameMastering. Of course, one can, and should say the same thing for authors, script writers, poets and musicians. We are all in the game of expressing our innermost philosophical ideas through the medium of art. And for us, our RPG Worlds happen to be our artistic medium. This is why I refer to RPGs as the new Art Form of the 21st Century. The difference, though, I think, between RPGs and other forms of art is that with the RPG the Author / Teacher / Philosopher comes in direct contact with the Player's thoughts and feelings in a way that is far more accessable than with other art forms. After all, we are collaborating together in the exploration of our Worlds. It is not a one sided art form. It is multi-sided, and as such the GameMaster is just as likely to be shocked and amazed, and learn new things, as their Players. Which is another marvel of the game. So I'm curious... do you find yourself imbuing your World, consciously or otherwise, with philosophical lessons that you think your Players might be either entertained or illuminated by? What kinds of musings do you find permeating your World?